Bishop Gorman punched a hole in Texas’ proud high school football reputation with a 44-14 dismantling of Cedar Hill on Saturday night in a nationally televised season opener before an overflow crowd of10,000 at Longhorn Stadium. 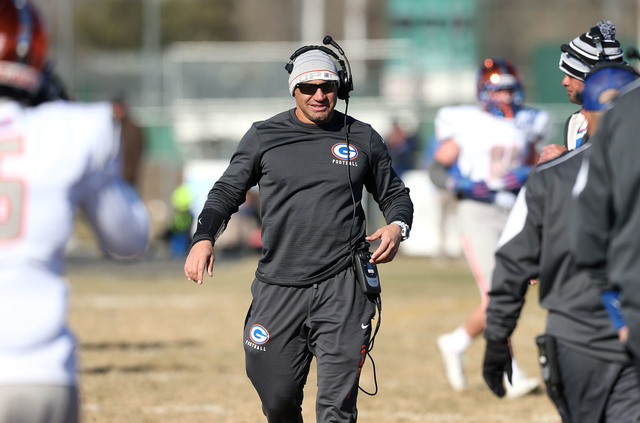 CEDAR HILL, Texas — Bishop Gorman punched a hole in Texas’ proud high school football reputation with a 44-14 dismantling of Cedar Hill on Saturday night in a nationally televised season opener before an overflow crowd of 10,000 at Longhorn Stadium. Gorman, No. 3 in USA Today’s national rankings, extended its winning streak to 40. The Gaels’ last loss was to Miami (Fla.) Washington 28-12 on Oct. 4, 2013. Cedar Hill, a public school representing a suburb of 47,000 located 20 miles southwest of Dallas, entered with a No. 5 national ranking. Both teams share the luxury of high-profile senior quarterbacks: Gorman’s Tate Martell, an Ohio State commit, and Cedar Hill’s Avery Davis, who has orally committed to Notre Dame. But when it counted, the spotlight belonged to Gorman running back Biaggio Ali Walsh, who is dedicating his senior season to his late grandfather, boxing great Muhammad Ali. The University of California commit finished with 17 carries for 194 yards rushing and three touchdowns. Cedar Hill rushed for only 88 yards on 21 attempts. Martell finished with 148 yards rushing and three touchdowns on 19 carries, and was 10-for-22 for 135 yards passing. Jalen Nailor caught seven passes for 86 yards for Gorman. Big plays were the norm for Ali Walsh and Martell. Ali Walsh had TD runs of 54 and 77 yards, and Martell scored on runs of 34 and 49 yards. Cedar Hill took advantage of a call reversal of a fumble for the first score. A bouncing Longhorns punt was ruled not to touch a Gael, but the call was reversed. Davis lofted a 28-yard scoring pass to Charleston Rambo for a 7-0 lead. Despite trailing, Gorman dominated the first quarter, running 16 more plays than the Longhorns. Finally, the visitors turned a long drive into points on Derek Ng’s 24-yard field goal. The Gorman defense came through with the key play of the first half, stopping Cedar Hill on a fourth-and-2 running play at the Gorman 46. Ali Walsh promptly raced 54 yards for a touchdown and 10-7 lead. Gorman defensive back Damuzhea Bolden, beaten on the Longhorns’ touchdown, made amends with a sideline interception of Davis to set up the Gaels’ second touchdown. Ali Walsh leaped the final 2 yards, capping a 49-yard drive. In the final minute of the first half, a holding penalty wiped out a 25-yard fourth-down touchdown throw by Davis. Cedar Hill pulled within 17-14 midway through the third quarter on a dazzling 72-yard broken-field run by Marquise Forman on a fourth-down fake punt. Several defenders missed chances to tackle the elusive senior. Ali Walsh then silenced the crowd with another long touchdown run between the hash marks, this one covering 77 yards, to expand the Gaels’ lead to 24-14. An interception by sophomore defensive back Greg Oliver put Gorman in scoring range late in the third period. Martell converted a third-and-17 with a sideline strike to Dorian Thompson-Robinson, then ran for a 13-yard touchdown. Martell confused the Cedar Hill defense with his clever ball handling for another score on the option keeper, this one for 34 yards that made it 37-14. He scored the final touchdown on a 49-yard run.